Pafford Medical Service of Arkansas is proud to nominate Michael G. Tharp as a 2016 American Ambulance Association Star of Life. Michael is an upstanding and well-loved pillar of our community and an exemplary member of the Pafford family. Michael started his career of service by serving our nation in the Army Special Forces Unit from 1975 to 1978. He has always had the desire to serve and comfort people in any situation. For years, Michael has been a private business owner in the Phillips County area and has been a great businessman with a thriving business, but his heart was drawn back to helping others. Michael started his EMS career in 2003 and became a full time Pafford employee in April 2005. 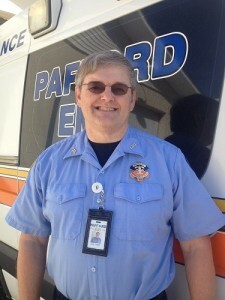 Michael serves as a mentor to many of his peers and new EMTs within our EMS system. He has invested quality time and energy in getting to know each of those peers on a personal level and has grown to understand their strengths, weaknesses, idiosyncrasies and styles. Because of this, he knows when to provide more support, when to allow time and space to accomplish tasks independently, and how to approach each of them in a way that is constructive and positive. Michael’s investment in his peers is infectious and has resulted in the creation of a high-functioning and productive group of employees. In addition to taking action and creating an environment where personnel can share openly, he has helped create an atmosphere in which each employee feels they are appreciated for their efforts. This promotes a comfortable workplace that staff enjoy coming to. It is evident that Michael cares about each of his peers as a whole and expresses this by showing an interest not only in their professional achievements, but in their personal achievements as well. Overall, Michael is a charismatic mentor whose style enhances our team morale, as well as the personal and professional development of his peers. His consistent support, understanding, and feedback fosters an environment that allows each team member to work both independently and interdependently. It is an honor to watch him grow into an active contributor to our overall vision, mission, and values.